Summertime… And the living is easy. Catfish are jumping, and the cotton is high. Don’t you cry. Blend up this emerald arugula and cashew pesto and serve it on little polenta bites. 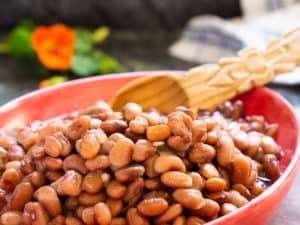 How about these inviting nibbles for hot summer weather? Simple to make and stress-free to assemble, plus you don’t need to be anywhere near the oven. That keeps summertime living easy. Pesto, from the Latin root verb pestare to pound. According to dictionaries, pesto an Italian sauce, made especially of fresh basil leaves, pine nuts, garlic, Parmesan cheese and olive oil. Typically, pesto is stirred into hot pasta. 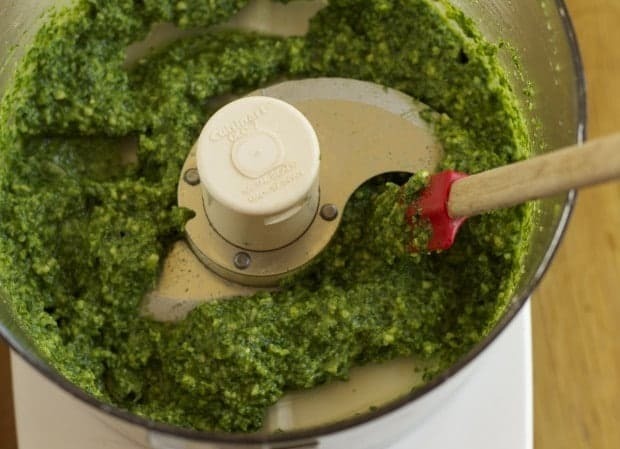 To make arugula and cashew pesto, pulse everything in your trusty food processor. Make sure to lick the spatula because its sooo good! There is nothing typical about pesto in our gourmet foodie world. We pound pesto from cilantro, mint, broccoli and kale—just about any green veggie. Try replacing basil with spinach to satisfy your fresh pesto cravings in winter. Pesto absolutely must include zesty garlic. 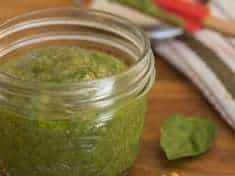 Make pesto with any nut, vegetable or cheese you want, just don’t leave out essential garlic. Creative cooks these days mash any crunchy nut we please into pesto, like the barely toasted walnuts in basil arugula pesto. A quick Google search will lead you to pesto made with pecans, pumpkin seeds, pistachios and almonds. I love the texture of the cashew component in today’s recipe. Would pesto purists consider it authentic if made with cheese other than Parmigiano-Reggiano? I think not. The rest of us–we try feta. Vegans can leave out the cheese and substiture fresh tangy lemon juice and zest. Make polenta in the microwave and spread it in a pan to cool. Or slice polenta rounds from a shelf-stable tube shaped roll. 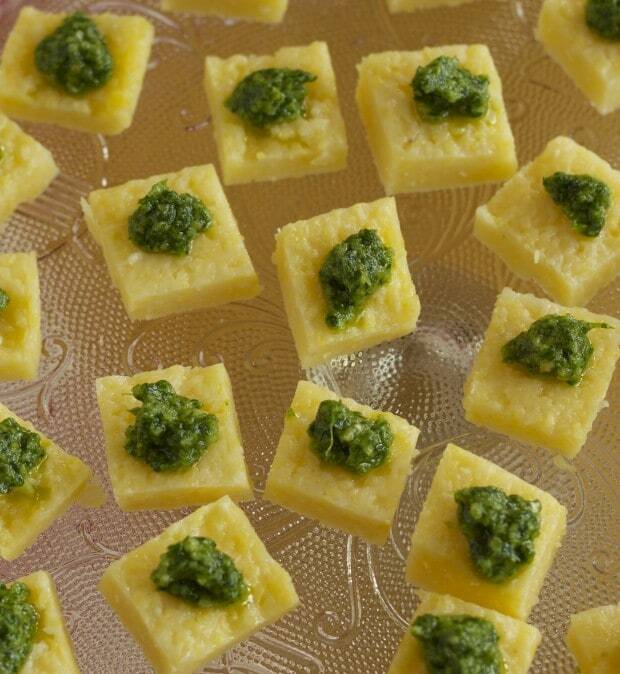 Top polenta bites with arugula and cashew pesto for awesome appetizers. 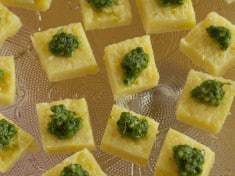 Link to my polenta recipe here, featured as the crust of a spinach and green garlic tart. Summer. Time. 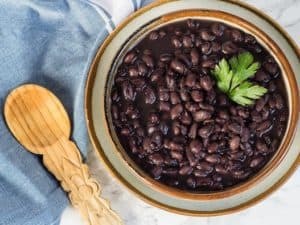 Get in the kitchen and cook something easy! This zippy pesto is delicious served with polenta. 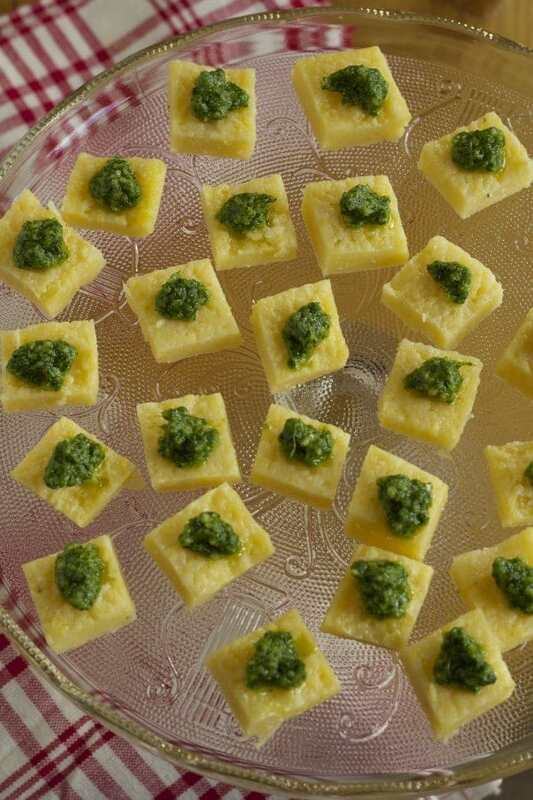 Cut polenta in 1-inch squares, top with a dollop of pesto and serve as a cold appetizer. Makes about 1 1/4 cups pesto. With the motor of the food processor running, mince the garlic by dropping it through the feed tube. Process until it is very fine and stops moving around with the blade. 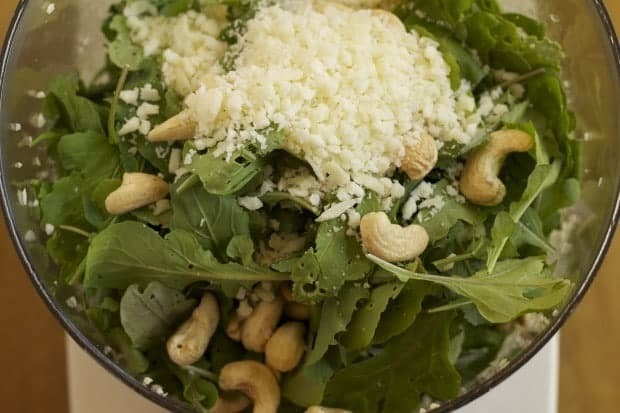 Add the arugula, cashews, cheese and salt to the food processor bowl. Process for about 10 seconds, stopping to move things around if they get hung up. With the machine running, pour oil through the feed tube in a thin stream, processing until everything is well blended. If you like super spicy pesto, whirl a second clove of garlic into the food processor. I need an appetizer for a Thursday night get together with the girls before seeing “Chorus Line”!